Or write in it actually. I'm from Manila and I speak Tagalog and I can't help but code-switch when I'm writing in this blog. Because I speak English better than Tagalog, this blog is mostly in English but I do have Tagalog expressions that leak into the posts. The Mother Tongue sometimes expresses it best. But when this SiteMeter report came in, I just knew it's time to say au revoir to my beloved Tagalog. 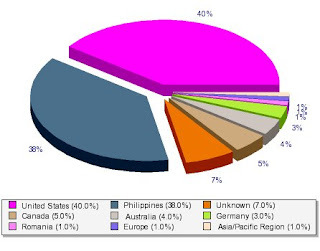 Yes, 62% of my readers are not from the Philippines. Hello to you all, readers and lurkers alike! Do tell me what the weather's like in your part of the world. Here in Manila, it's like a burning oven. Unbelievable how hot it is considering Christmas is just around the corner! Oh, and may I remind you that I have a blog contest happening! I'm giving away two Sunsilk hair treatment gift packs. Join now! It's freezing in NY this week! Don't take this amiss but I often scratch my head over this one: why do Tagalog-speaking people "tagalize" their English? Muscle becomes mahsel. I'm sure I could come up with better examples than that but my brain is weak - it missed it's daily dose of weed. Joke (and a bad one at that. Lol). Hey Wendy, bundle up! Sending you all my warmth from hot hot Manila! Hey Chin, no worries. Tagalog is a very alive language, adapting a lot of words practically every single day. I can't catch up! A lot of English words are now Tagalized (titser, riserts, etc). I hate the text speak ("Hungry na me") the most though.